Mya Kerner, Oil and graphite on panel, 30 x 40 inches, 2018. Available for purchase through Nahcotta Gallery. Mya Kerner, Oil and graphite on panel, 8 x 10 inches, 2018. Mya Kerner, Harvested Pigment, Oil Paint, and Graphite on Panel, 30 x 40 inches, 2017. Mya Kerner, Harvested Pigment, Oil Paint, and Graphite on Panel; 24 x 36 inches, 2017. Mya Kerner, Harvested Pigment, Oil Paint, and Graphite on Panel, 24 x 36 inches, 2017. Interested in myth and the stories of the landscape, I wonder what memories the land holds. Records of denudation captivate me as these notes present a segmented image of the whole. 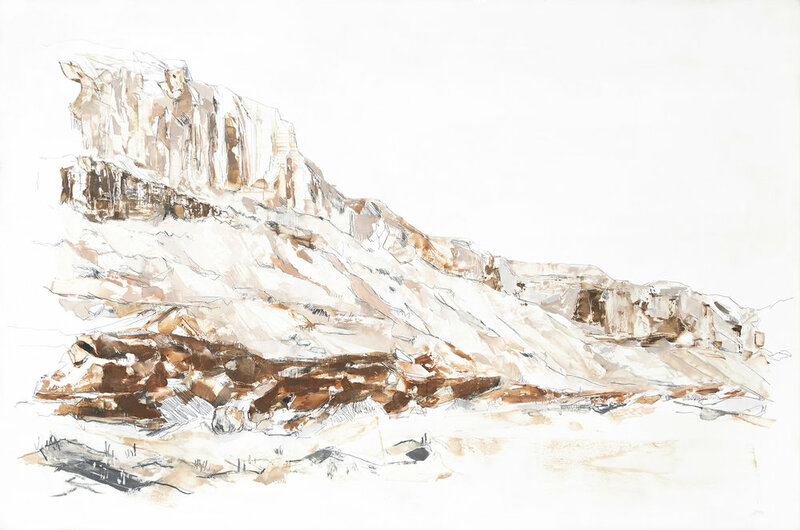 I depict geological disruptions, carved moments and parts within the landscape. It is in these records that I explore our place. Scattered about the viewer, rest fallen rocks, fragmented remnants and witnesses to some indefinable future. I approach the panels with impulsive, yet developed mark making. As I soften and exaggerate edges, my hand, arm, and body follow movements developed from my sculptural practice, with gestures that mimic the contours of the landscape. This exertion reflective and empathic energy allows structural areas of my work to hold stable and for textural play to denote sliding and crumbling. Line work carves a journey through stone, drawing a visual labyrinth and creating space for the viewer. The physicality of the marks moves beyond a beautiful scene, awakening an awareness of fragmentation of perception and experience. I have worked to translate the marks of the terrain onto a two-dimensional surface. My intent is not to re-create Nature, for that is not my role, but I work to capture something of the memory and the history of a landscape. I think about the individual in the context of the mountains and their immensity. The mountains remain, while our perception shifts, like atmospheric effects, obscuring, then revealing, in erratic flow. In this movement, we have forgotten that civilization is a construct, built from the pieces of deconstructed mythologies. My sculptural background has heavily influenced the way I approach paint as a material. I paint in a way more like sculpting, using spatulas, mechanical pencils, and X-acto knives. My wire drawings extrude the contours of my paintings, forming an interdependent framework waiting to be filled by the viewer, with their thoughts and memories. I want to pull at whatever remains in the viewer’s understanding of the landscape. As I gaze out to the mountains from this urban environment, the distance marked by water, I think about the truth of that distance. I wonder what memories the mountains hold, and what indefinable futures are told to our deaf ears. As our planet moves deeper into the threats of a changing climate, we are now reminded that, to Nature, the individual is irrelevant, lost to the vastness and susceptible to the ephemerality of being. Still, the individual is a part of the whole, and so we must start from ourselves.